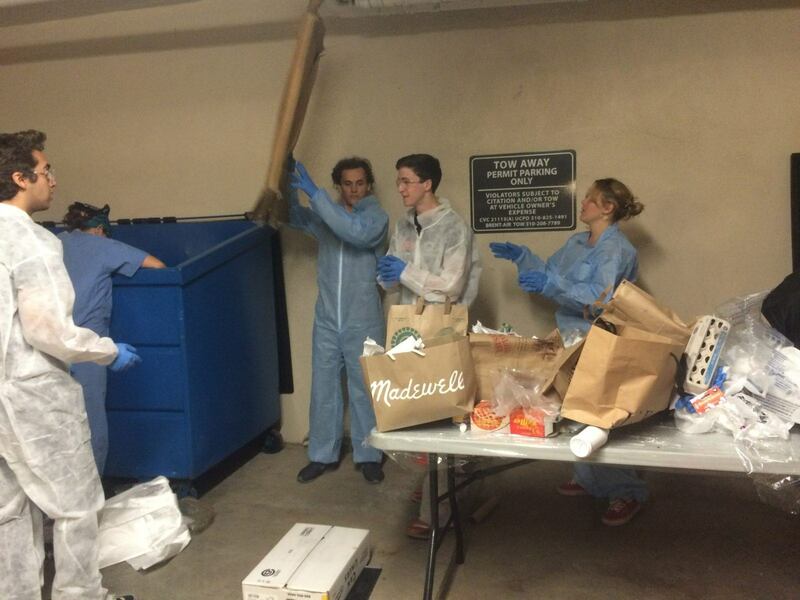 Last week, we tagged along with the Graduate Housing Team on Friday for their waste audit of the Hilgard Avenue buildings… and we learned so much! I don’t think any of us had really thought about how involved of a process waste sorting is, or how specific it can be. It was definitely a great experience and made us more conscious about how the products we use can contribute to problems in both managing waste infrastructure and consumer consumption. On Wednesday, the team distributed in-unit compost caddies, which were provided by the Athens and Ecosafe companies. The Grad Housing Team is planning on assessing the amount of compost generated and sorted by residents and has waste audits scheduled for 5th week and 10th week, which they’ll then use to cross compare to assess the success of instituting composting. After meeting with Grad Housing to go learn about their project goals and specifics, we headed down to the parking garage, where residents bring their waste. Dumpsters are provided for landfill and recycling, and the new green composting dumpster fits nicely in the waste area. After suiting up in hazmat suits, protective eyewear, and gloves and armed with trash-pickers, their stakeholder Jessie educated us on the waste audit forms and sorting specifics. The Resilience Team had no idea how specific and complex waste sorting is! Jessie outline several main categories of sorting. The first was organics, which include all food waste, greenscape waste, and soiled food paper. Second was paper products, which include mixed paper, cardboard, paper plates. Plastics included #2 plastic, color and non-color plastics, natural plastics, and plastics with a CR. Next were recyclables, including aluminum foil and glass used in food packaging, followed by landfill, textiles, and electronics/hazardous waste. 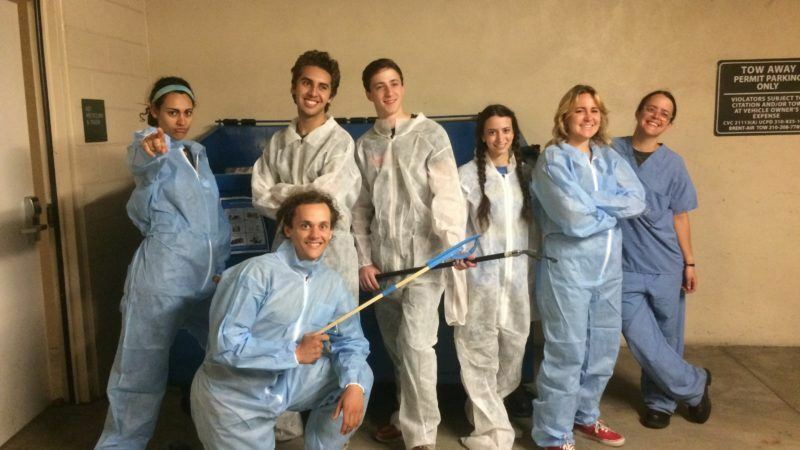 After the introduction from Jessie, the Grad Housing Team got to work sorting the dumpsters. The recyclables tended to be relatively clean and easy to deal with, but sorting through some of the items in the food waste and landfill categories proved a bit messier–although quite interesting! Some of their favorite items included half eaten pizza and a bottle of wine that was a third of the way full. A few members even joked that they would make perfect contributions for the SAR potluck that was held later that evening (don’t worry, they didn’t end up bringing their waste audit finds to share with the rest of us)! All in all, it was an informative and entertaining afternoon, and we really enjoyed spending time with Grad Housing.